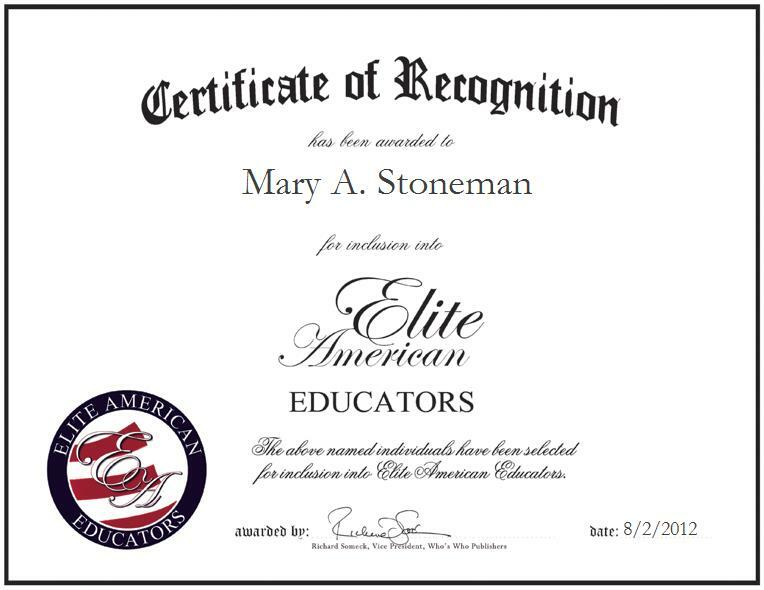 Mary A. Stoneman is a teacher at Westside School, a subsidiary of the Coachella Valley Unified School District. Heightened proficiencies in the areas of writing disciplines and English language conventions allow Ms. Stoneman to shine in her chosen capacity. She is currently responsible for setting standards for students in a combined classroom, conducting programs for students to write thank-you letters to UNITED STATES veterans, and integrating united sates geography and history into curriculum. Ms. Stoneman is also in charge of exposing students to life outside of the classroom, overseeing letter-writing and benefactor guidance, and utilizing innovative educational methods to reveal students’ academic capabilities. She is very proud to have received the Teacher of the Year Award from the VFW in 2000. She is a devoted teacher of a combined 2nd and 3rd grade class at Westside School, and she always sets very high standards for her students. She really believes that her students can achieve the high standards she sets for them. She worked on the administrative end for the Oakland Athletics minor league team, where she was responsible for selling tickets; she sang the national anthem and held many other duties in her former capacity. Now a successful educator, Ms. Stoneman also serves as a professional singer and guitar player. She feels that singing and her musical experience with theGirl Scouts of America helped her to develop as a person and to express herself.